March 24, 2011 was a day to remember due to the following 3 incidents. 1. The Junior College student with straight As and 1 B and an excellent testimonial from her form teacher could not work "long hours." She had phoned me the previous night to let me know that she would not work the long hours of internship as it was "tiring". So, I told her that I would phone her back regarding her terms and conditions of work. That implied that she ought to stay at home till I decided since my offer was not accepted. Yet she presented herself at the Surgery today at 8 am as I had told my assistant Mr Saw that the intern would not be coming. I asked if her father or mother was against her working hard? She had no objection to the hours of work during the interview yesterday and even arranged for her driving test lessons to take place at 5 pm on Friday. She would work 6 days a week with one weekend day off. She arranged for 6 weeks of internship - a very short period but that would give her some credentials as she had applied for an AVA veterinary undergraduate scholarship. Apparently her father was against it. "You will be going overseas to study," I said sadly to this young personable lady who did not need to take the "O" level examinations unlike the average Singaporean student as she was the "top 10% of her cohort likely to go to the university." "Your working hours are non-negotiable. In any case, you will be off before 5 pm on Friday for your driving test at Bukit Batok and you don't work on one Saturday or Sunday." I was rather sad that she could not put her foot down for her own future. "You need to think for yourself and not get tied to the apron's strings." I wished her good luck and let her go. Over-protective Singaporean parents who think that the world owes their academic superstar-children a living will be in for a rude shock when their children goes to the real world of commerce as their attitude doesn't make the progeny street-wise and realistic. 2. Mr Saw phoned me at 11.30 am while I was at the Singapore General Hospital area to say he was not feeling well and would try his best. He had generalised muscular aches. I often told him: "You are a young man." But he would say "I have an old man's body." Mr Saw is a very responsible assistant and if he was a Singaporean, he would make a very good vet. I could see that he has the passion during the past 3 years with me and I had mentored him with whatever knowledge of the skills of surgery and medicine I had. I rushed back after taking a few photos of Everton and Spottiswood Park conservation houses (bright sunshine - good for pictures). 3. I told my associate vet that Mr Saw was sick and he would be taking time off. I would be the customer service officer taking money and processing the credit card and nets machine as my other staff was on leave. Another assistant Mr James Ang had retired at the age of 73 years as he was bent double for some unknown reason. I had to let him go in February after some 20 years with me. He would be giving prospective clients a bad impression compared to the nubile young girls at competitor's practice as he was hunched as if he could not stand straight. Two days ago, the mother and adult daughter of a Maltese with red eyes had smiled at me when they saw me handling the payment at reception counter after consultation with my associate vet. They were old clients. The daughter had now become a grown up in her early 30s. I said: "Like the PAP who introduce new politicians at the elections, I must renew the vets at Toa Payoh Vets. Young vets, new ideas. Lots of energy." 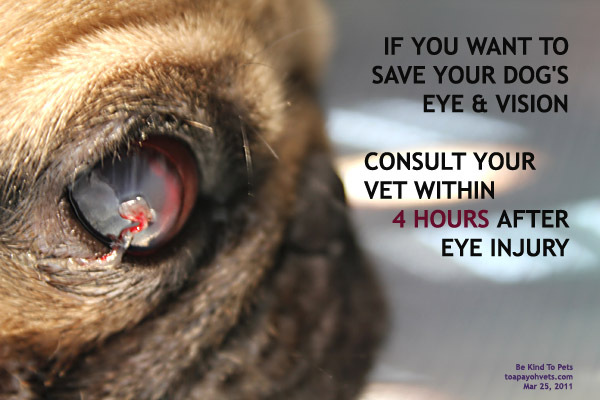 Soon, 3 young adults in their early 30s (2 ladies and one gentleman) came in with a pug with a bleeding leaking eye. I got them registered as they were new clients. I could see that one of the two young ladies was quite distressed. My associate vet handled the case as usual. I could see that it was a case of a central corneal ulcer, a common problem in breeds with protruding eyeballs. "So what happened?" I asked the gentleman who came out of the consultation room and sat on the yellow chair after some minutes of discussion with my associate vet. I had been inside the room to evaluate the eyeball at one time but left without comments. He said: "The doctor is making arrangements to hospitalise the pug." I was extremely surprised. Associate vets do get some freedom to do their cases in the manner they deem fit. Toa Payoh Vets is equipped with anaesthetic and surgical facilities and is capable of handling a corneal ulcer case. Referring what I considered to be a simple case of corneal ulceration to be hospitalised in another practice in Singapore was a big shock to me. I don't want the vets at Toa Payoh Vets to be known as the "Old School Vets". This term was made known to me from a staff of a practice I visited last week as I brought a young male intern with a blue golden lock of forehead hair to visit the practice to buy some vaccines. The lady manager in this practice where the vets will refer every "difficult and potentially litigious" surgical case to a brand-name practice said to me: "My friend asks me which veterinary clinic I was working and when I told her, she said I was working with an 'Old School Vet'. I don't mind. I am very happy and well treated in this clinic." So, this practice does vaccination, dental scaling, sterilisation and removal of lumps. Nothing more complicated. This definitely was not the sort of veterinary surgery I practise for the past 30 years. Now my associate vet now making phone calls to another brand name practice to pass the case over. This passing the buck of a simple case of corneal ulcer is not for associate vets of Toa Payoh Vets. If any associate vet can't perform surgery of a simple corneal ulcer and refers to a 2nd a brand name competitor, there is the "can't even do a simple corneal ulcer case" implication. I know some vets dislike complicated surgeries as they are potentially litigious but this was a simple corneal ulcer case, in my observation. I went to the consultation room and asked my associate vet what was going on. Why was she referring to a brand name practice? She showed me the letter from Vet 1 to consult a certain vet in a brand name practice and since that vet was unavailable, she made alternative arrangements. Eye injuries are emergencies and ought to be treated within 4 hours. Now, it was 5 days post injury. I was extremely surprised as my associate had at least 2 years of practice before joining me. If she could not deliver, she ought to consult me. There was this potential of the competitor's vet and staff labelling and bad-mouthing Toa Payoh Vets as being incompetent to handle a corneal ulcer. I asked the owners to leave the consultation room, closed the door and had a private chat with my associate vet. I said: "This is going to be a highly contentious case as there is a lot of emotion involved as Vet 1 had given a name of a vet who would not take the case. The owners are much distressed. You just refer them to another practice. That practice employs fresh graduates and rookie vets. You are not doing the dog a favour by just making appointment for an unknown vet to handle this case if the older vet was not available. I will take over this case as the owners are going to be unhappy should the other vet mis-treat this case." If I refer a case to a vet, I must make sure that this vet has the relevant experience and a high standard of practice and will perform the surgery and not his fresh employee graduates. It does not mean that this vet must be employed in a brand name swanky practice. I was in the consultation room earlier too but the associate did not introduce me and I did not introduce myself too. So, the distressed lady was apprehensive when I examined the dog's eye and tried to pull the dog back. So I left the room for my associate vet to manage the case. I was around and yet she did not think of asking me for advice when issues and problems arise. Life for a practice manager is full of surprises and changes. I told my associate to ask the clients to come in and to formally introduce me as that would be the correct way in professional practice. This case was high voltage and lightning had struck. 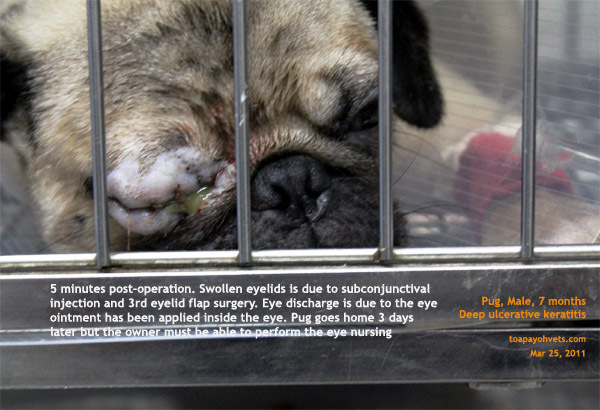 The pug's eye was going to collapse any time soon and any miscommunication or bad referral resulting in the pug being blind would have cast Toa Payoh Vets in a bad light. "The owners must be thinking I am just a receptionist since I was registering their case," I said to my associate. "This case is going to adversely affect the reputation of the Surgery if the brand name practice vet bungles the surgery. How do you know whether that this brand name practice will or will not assign a fresh vet with no experience in handling a Descemetocoele? This corneal ulcer is in a highly dangerous state as it is going to perforate soon. "You know that this brand name practice's senior vet may not be available. If he assign a fresh vet to do it, the cornea perforates on the way to the vet, the pug goes blind. So, the owners would just bad-mouth Toa Payoh Vets as the practice that referred the case." I did not mention that this brand name practice charges top dollars and this case would set the owners back by over a thousand dollars. My associate opened the door and asked the 3 adults and pug to come in. She introduced me as her boss. "I am the founder of this practice," I elaborated. "I did not introduce myself earlier in the consultation room. I am responsible for the practice management." I was the licensee and any complaint or litigation would mean I have to waste time attending to investigations. I had assessed that the clients were sophisticated and knowledgeable and this is the profile of the younger generation. 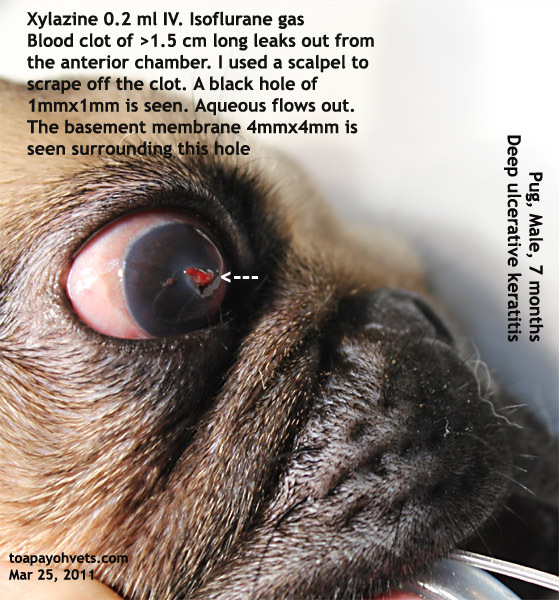 Whether they would complain about being passed the buck by Toa Payoh Vets would depend on how this emotional situation was handled and whether their pug's eyeball would be enucleated by the other vet. Owners just don't like the idea of their pets losing an eyeball. 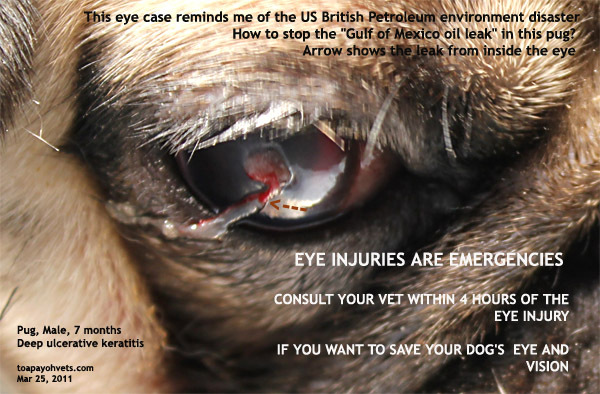 This was a case that had a 50:50 chance of saving the dog's eye. If the vet knows how to resolve the problem. The gentleman summarised the situation succinctly: "There is no one vet you can recommend to treat my pug." He must have superman's hearing as he was in the waiting area and he could not have had heard my conversation with the associate vet. I said: "It is not necessary to refer the case at all as Toa Payoh Vets has the capability and experience to handle this case. "I have handled several cases of corneal ulcerations and if you have no objection, I will do the 3rd eyelid flap. 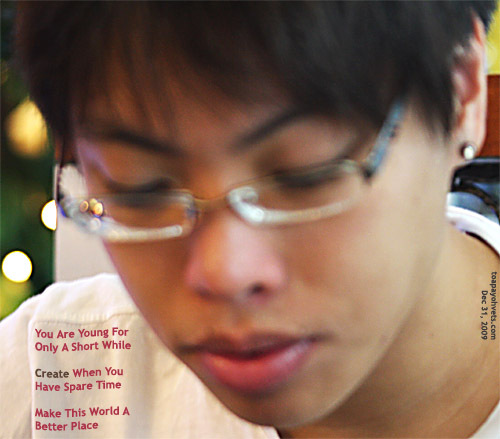 Have you visited Toa Payoh Vets' webpage on eye problems in the dog?" Such sophisticated young adults would have had checked up Toa Payoh Vets' website at the waiting area with their iPhone 4 while I was having a closed-door discussion with my associate vet. The world has changed tremendously. Internet information flows freely and the clients know much more than the vet sometimes. The gentleman said: "You operated mainly on Shih Tzus' eyes." This was an excellent feedback from him. 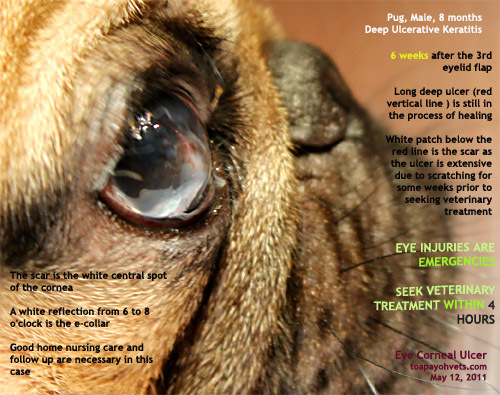 I had not analysed my webpage on eye problems in the dog at www.toapayohvets.com. I had not posted other breeds I had treated as it is extremely time-consuming to create webpages to write the case report of all breeds I operated upon. I don't take pictures of all breeds too. This article took 6 hours to write and to create the supporting images. There are so many things I want to do and I just can't have time to do many of my favourite things if I write case reports of all breeds having corneal ulcers. As a vet who does surgery, the range of surgical cases is from the head to the tail. I replied: "Shih Tzus have the highest number of eye injury problems in my practice. Any breed with protruding eyeballs may suffer from this corneal ulceration problems. This includes the Pekinese and the Pug." To cut a long story short, the owners had no objection in my performing the surgery. If they were not comfortable, I would just ask them to make their own decision to select their own vet. My associate vet watched me doing the surgery. She said she had not seen me doing a surgery. Many of my surgical cases have been passed on to her to do and that was why I had less to do. INFORMED CONSENT. I took time to explain the risks of anaesthesia (death as this pug was infected for the past 5 days and could be infected in the blood stream. A delay of 24 hours with antibiotics prior to surgery would be preferred but this was an emergency as the cornea will perforate soon. I advise that I would give baytril antibiotics IV and perform the surgery soon). I explained the risk of surgery (bleeding, pain, infection, collapse of the eyeball due to infection leading to the possibility of enucleation as the owner had not consulted the vet within 4 hours of the eye injury). The gentleman signed the form. 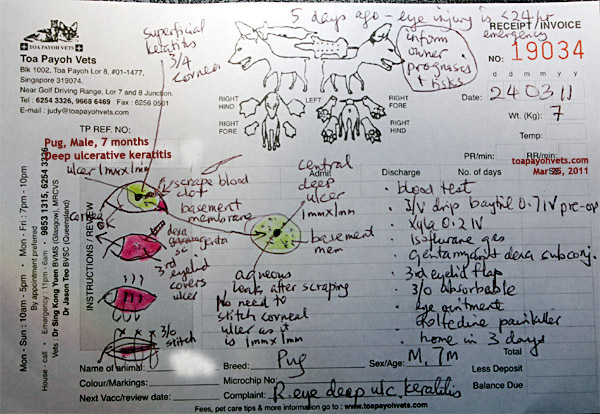 "Isoflurane gas alone is the safest anaesthetic for this young pug of 7 months with a possibility of infection of the past 5 days," I said to Mr Saw who takes close notes as he would be operating his own practice in Myanmar soon. "However, the pug's nose is flat and the pug will struggle a lot, leading to perforation of the cornea and collapse of the eyeball. So, what sedation would you give? Your favoured domitor and ketamine IV?" Mr Saw was not so sure. 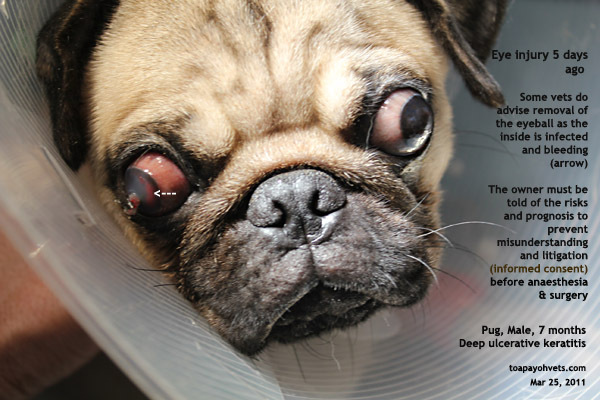 This was a pug with suspect infection after 5 days or more of eye injury. 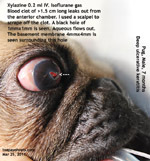 The pug's eye look like an earthquake and tsunami disaster area as seen in the recent pictures of the calamity in Japan. Big patch of white gel and a stream of red-tinged flow of gel and blood at one end, measuring around 1.5 cm long. A continuous stream if you are observant. It reminded me of the oil spill in the Gulf of Mexico although I did not see the actual leak - only oil slicks in the ocean. Here, I could see the stream. It was fascinating as a case but extremely dangerous for the pug. A delay in treatment and the corneal hole would enlarge and the inside aqueous humour would just splash out. The end of the eyeball, although the vet can still stitch up the cornea. 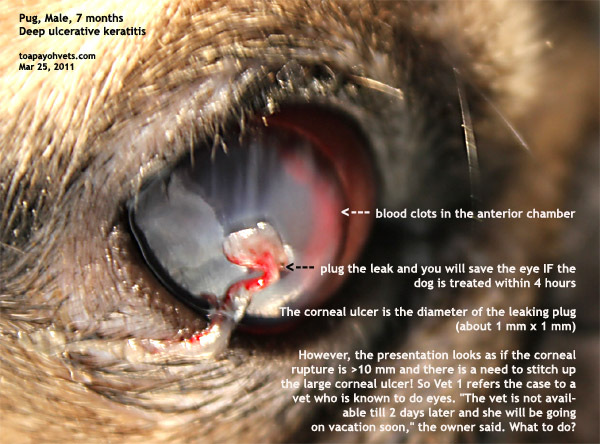 Most vets will not encounter such corneal ruptures or stitching and so it can be quite frightening to encounter this case. I used 0.2 ml xylazine IV. Waited 5 minutes. The pug vomited out its food as this was the effect of xylazine (and even in domitor or domitor/ketamine IV) Then isoflurane gas. The 3rd eyelid flap is done. Basically the needle goes into the upper eyelid, then under the 3rd eyelid and back out to the lower eyelid. Tied in a knot. "It will be easier if an assistant pulls out and upwards the 3rd eyelid for stitching," I said to my associate vet as Mr Saw automatically used forceps to do it for me. Several combinations. For this case, I use 3 simple interrupted sutures. Another case, I used a horizontal mattress and one interrupted. Or just one horizontal mattress. Question. "Are 3 sutures sufficient?" - Yes. SUBCONJUCTIVAL INJECTION OF GENTAMYCIN AND DEXAMETHASONE. I know some vets believe that steroids should not be used in eye ulcerations. Well, a small drop of dexamethasone will alleviate the inflammation and pain and does not cause harm. The IV drip continued. Tolfedine and baytril given SC. The pug was sleeping and woke up fresh the next day. Very active. At 3 pm on day 2, the gentleman and his wife visited. They took leave from work. It was one of those money can't buy joys to see the distressed lady back to her normal self. I expect the pug's ulcer to heal in 14 days' time and the pug to go home on Day 3. The outcome should be a white spot in the centre of the cornea and no eyeball collapse or infection. 1. Why did Vet 1 refer the case to a vet that is not available? This is a mystery to me. He probably thought that the cornea ulcer was extensive, needed stitching and he had no facilities to do it and had referred to my associate vet. However, I was on counter duty and saw the case first. The eye ulcer looked terrible as if it had a big earthquake. It appeared to be a white reddish gel patch of at least 5-8 mm in diameter. Actually, it was 1-2 mm in diameter when I used a scalpel to scrape away the out flowing blood clot. After scrapping, I showed my assistant the black hole measuring around 1 mm in diameter. Aqueous humour leaked out from the hole. Surrounding the black hole was a circle of basement membrane measuring around 4-7 mm in diameter with the black hole as the centre. This membrane would rupture soon if the owners just don't bother to see Vet 1 who advised emergency eye treatment correctly and professionally. To estimate the size of the corneal perforation, see the 'stream' of gel coming out as a streak. It was around 2-3 mm. See the images. 2. 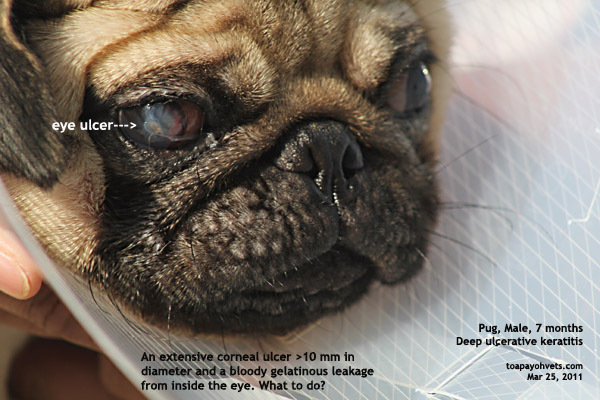 The pug had a perforated ulcer, not a Descemetocoele. The initial presentation was similar to a Descemetocoele with a streak of gelatinous or eye discharge. So, I said "Descemetocoele" to my associate at the examination room as the dog did not permit proper eye examination. Under general anaesthesia, after scrapping away the blood clot, a black hole of 1mm x 1mm with watery aqueous seeping out indicates that the correct diagnosis is a perforated corneal ulcer also known as deep ulcerative keratitis. 3. Corneal wounds can be sutured with fine 6/0 sutures. Small perforations are best left to heal with the 3rd eyelid flap surgery. And they do heal very well if the inside of the eyeball is not infected. Can you see the pinkish-reddish blood sediment on the medial inner side of the eyeball in one of the pictures below? I hope this report will be useful for undergraduates struggling to study so many subjects for their examinations to appreciate the anatomy of the dog's eye and its changes during ulceration. For readers of my blog, updates and more pictures are in toapayohvets.com, goto DOGS - EYE PROBLEMS. 14 days after 3rd eyelid flap. On the 14th day, the pug came in for stitch removal. The leak had been plugged by an abundant cap of white scar tissue. 30 days after 3rd eyelid flap surgery as I write this update, the young couple has no complaints. 42 days after 3rd eyelid flap. The ulcer is healing slowly as it is deep and extensive. On the 42nd day, the owner came for a review as the dog's eyes were reddish. 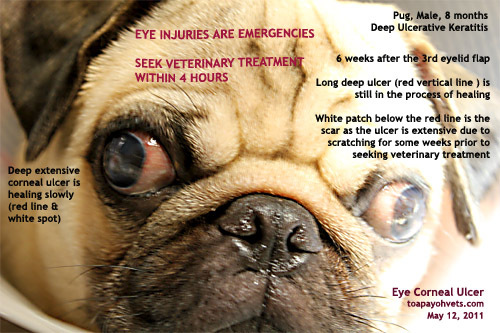 However, the vertical ulcer has healed but not fully while the 6-8 o'clock corneal ulcer has changed to a white spot. 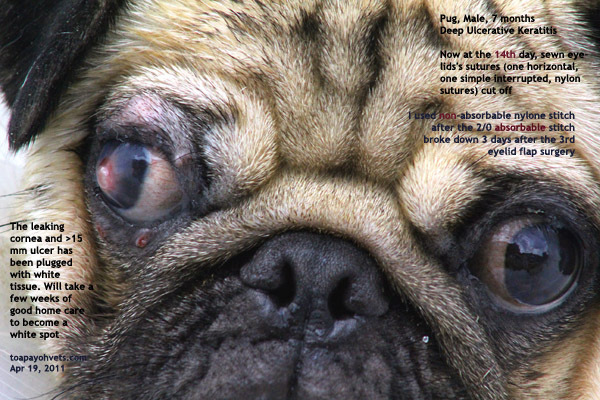 The pet shop operator had sold the pug with the right eye ulcer already present. I had focused on the right eye due to the drama of the situation. The left eye cornea was already pigmented (when I review the images again after the owner came on the 42nd day) due to long-standing injury at the pet shop. Both eyes ought to be examined. There was much stress and worries about losing the right eye due to the fact that the owner's "eye-specialist" vet referred to by another vet was not available. My associate vet was trying to refer them to another vet before I stepped in. I prioritised my time in treating the right eye and resolve the owner's problem first. It seems that the right eye is saved in the sense that it did not rupture and deflate. The excellent post-operation care by the young couple has been important in this case. 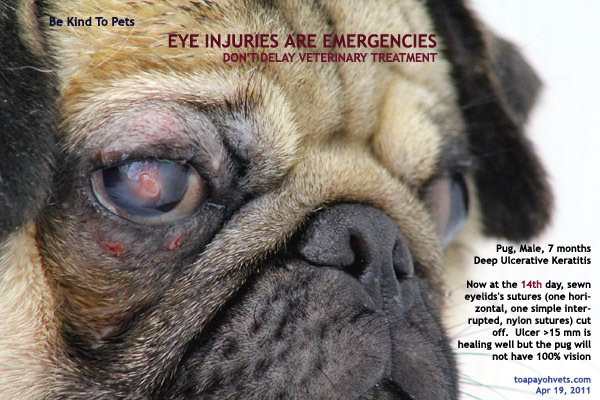 NEVER buy a pug with eye injuries from the pet shop or breeder unless one is kind and prepared to spend money and time to send the dog for prompt veterinary treatment. Pugs for sale are quite rare in Singapore and so the very few pug lovers have very few choices of getting really good conformation pugs.